Lungs: complex and in-folded, joined pharynx by trachea with cartilaginous support. Lungs used for CO2 dumping as well as O2 intake due to keratinized skin. Neck: Often lengthened and more flexible. Head: Buccal pumping eliminated, so head can be smaller and more domed. Skull: (Captorhinid) Like "Anthracosaurs" but no otic notch or intertemporal. Postparietal, tabular and supratemporal reduced and on occipital surface only. Supraoccipital supports posterior of braincase, large stapes supports it laterally. Transverse flange on pterygoid. Elimination of large fangs. Basicranial articulation with palate moveable. Basioccipital and exoccipital form occipital condyle. Fits in ring formed intercentra and arches of atlas: ball and socket joint. Palatoquadrate reduced to quadrate and epipterygoid. Lower jaw has 1-2 coronoids and splenial. Vertebrae: Spool-shaped centra. Small, crescentic intercentra. Ventral axial muscles: Development of intercostals used to move ribs in respiration. Ribs: lighter and may be joined ventrally by sternum as specialization for intercostal ventilation. Postural role assumed by epaxial muscles which are no longer primary locomotor muscles. 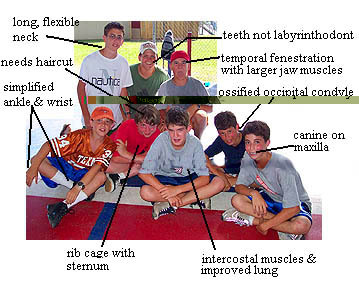 Limb bones: lighter – possibly reflecting proprioreceptor system. Feet used as levers for propulsion, rather than holdfasts. Ankle forms distinct hinge joint (mesotarsal). Tibiales, other bones of pes fuse to form astragalus. 23453 manus, 23454 pes. Pelvis: Sacrum expanded from one vertebra to 2-3. Hearing: convergent development of stapes (hyomandibula) as principal sound conduction mechanism of middle ear (i.e. connects tympanum with inner ear). Excretion: Duct linking kidney & cloaca. Bladder not used as much for water recovery. This function tends to be performed by kidney. Amniotic Egg: additional membranes (amnion, allantois chorion) in egg act to permit gas exchange but avoid water loss, permit large amounts of yolk storage, isolate waste products during development. 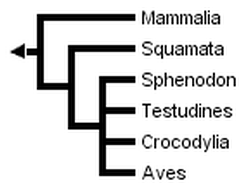 If extinct amniotes are considered, the phylogeny is much more complex and controversial. Formerly, captorhinids were believed to be closely related to turtles (Gauthier et al., 1988b, c), but more recently, several groups of parareptiles have been sugested as closest relatives of turtles, such as procolophonids (Reisz & Laurin, 1991; Laurin & Reisz, 1995), pareiasaurs (Lee, 1993, 1994, 1995, and 1996), and Eunotosaurus (Lyson et al., 2010). Some paleontologists (Rieppel, 1994, 1995; Rieppel & deBraga, 1996; deBraga & Rieppel, 1997) place turtles among diapsids, especially as the sister-group of euryapsids (a group of Mesozoic marine diapsids). 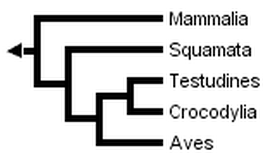 Phylogeny and Classification of Amniotes provides information about the phylogenies incorporating extinct amniote taxa, and provides a detailed classification of the relevant groups. Temporal Fenestration and the Classification of Amniotes discusses how temporal fenestration has been used to classify amniotes, and how tempororal fenestration evolved. Phylogeny: Cotylosauria : Diadectomorpha + Stem Amniota : ?Casineria + ? Westlothiana * : Synapsida + Sauropsida. premaxilla with palatal, maxillary & nasal processes [MR05]; frontal contacts orbit; various patterns of fenestration related to additional musculature for jaw from dermal skull and development of musculature to supply static pressure at jaw; squamosal contributes to margin of posttemporal fenestra; hemispherical & ossified occipital condyle; pterygoid with distinct palatal surface, transverse flange and quadrate ramus [MR05]; pterygoid quadrate ramus with separate dorsal flange extending from basicranial articulation to dorsal process of quadrate, supporting elongate epipterygoid [MR05]; loss of labyrinthodont teeth, caniniform tooth present on maxilla; 2 centers of ossification in scapulocoracoid; astragalus present. Numerous additional characters listed above. Links: Introduction to the Amniota; Amniota; Amniota. References: Müller & Reisz (2005) [MR05]. ATW051015.